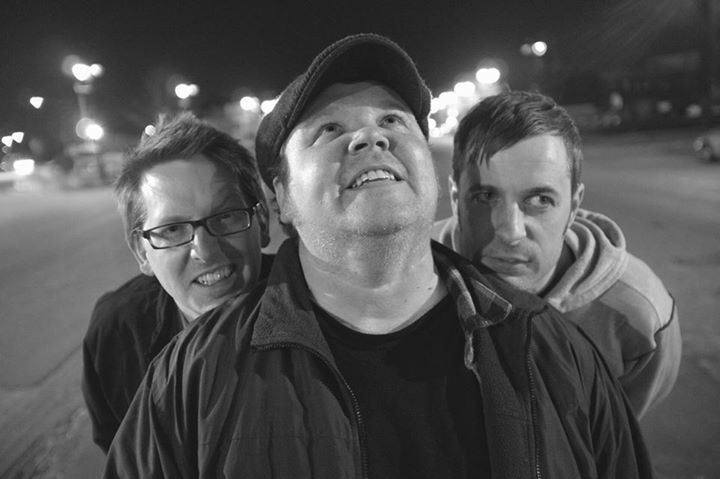 Fangs and Twang’s Andy Benes, Billy LaLonde and Joe Bertoletti. Fangs and Twang know how to sink their musical teeth into monster folklore. 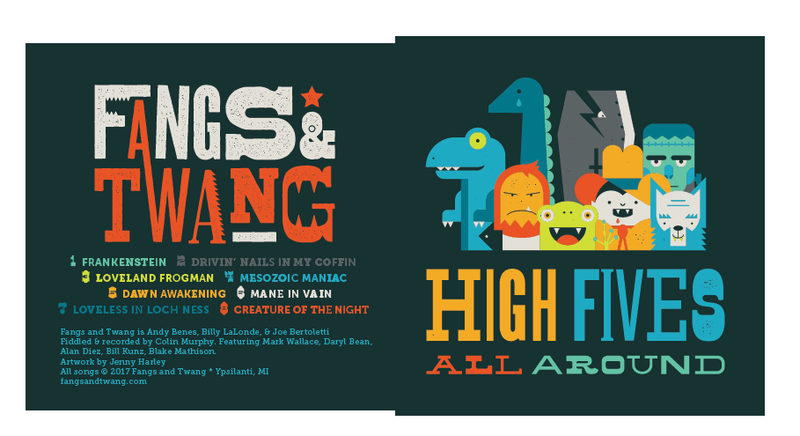 The Ypsilanti, Mich.-based roots rock and bluegrass trio sing about Frankenstein, the Loch Ness Monster, and other notorious creatures on their new album, “High Fives All Around,” which comes out today. Bassist Joe Bertoletti and his bandmates, Andy Benes (guitar, vocals) and Billy LaLonde (drums, vocals), seek inspiration for their second album’s eight monster-themed tracks from books, movies, comics and regional urban legends. It nicely follows in the footsteps of their self-titled 2015 debut. One of the band’s favorite tracks, “Loveland Frogman,” is based on a Loveland, Ohio urban legend dating back to 1972 about two local sightings of a creature that resembled a humanoid frog. Another song, “Mesozoic Maniac,” is influenced by a Calvin and Hobbes comic strip, while “Dawn Awakening” pays tribute to a Fangs and Twang monster favorite – vampire cowboys. Fangs and Twang started recording their monstrous tales for “High Fives All Around” in January with Ypsilanti-based engineer and musician Colin Murphy and completed the final mixes about two weeks ago. The album also features Murphy on fiddle, Daryl Bean, Alan Diez and Bill Kunz on horns and Mark Wallace and Blake Mathison. Fangs and Twang will celebrate the release of “High Fives All Around” during a hometown listening party on Friday at Go! Ice Cream, 10 N. Washington St., in Ypsilanti. The band will perform two sets at 6:30 p.m. and 8:30 p.m., and attendees will be able to enjoy a special Fangs and Twang-inspired sundae created by Go! Ice Cream. “It will be the first time playing live with a horn section, and we’ll have Colin playing fiddle, and my dad, he’s from Chicago, he’ll be playing keyboards with us as well,” Bertoletti said. Bertoletti credits his family with inspiring him to play bass. About 10 years ago, he picked up a bass to join his family party band, which includes his parents, sisters and cousins. However, his passion for music developed while growing up in Chicago and attending the University of Illinois. That passion also led to playing in local bands and ultimately forming Fangs and Twang with Benes and LaLonde about three years ago. Together, Fangs and Twangs decided to combine their roots rock and bluegrass music with monster-themed fun. As for the future, Fangs and Twangs will play several live dates in Michigan, including Bemo’s Bar in Bay City, Mich. with Back Forty on June 10 and Detroit River Days on June 25. Along touring, the band is already thinking about what monsters to write about for the next album. One option includes letting the public pick the next monster through a March Madness-inspired contest.